The spices are usually toasted and then ground together. There are many different types of chillies or using their proper name ‘chilli peppers’. Although most people think of chillies being hot this is not necessarily so; some chillies in fact are not hot at all. Red chillies do tend to be hotter than green chillies. They are grown all across the world but India is the biggest producer. In the restaurant we are fortunate to be able to use chillies from a local chilli pepper grower – Seaspring Seeds in West Bexington www.seaspringseeds.co.uk They currently offer 50 different varieties of chilli pepper seed and many other vegetables. Everything is developed – trialled, tested, and tasted – on their smallholding in West Dorset. The famous Dorset Naga was developed in this way. 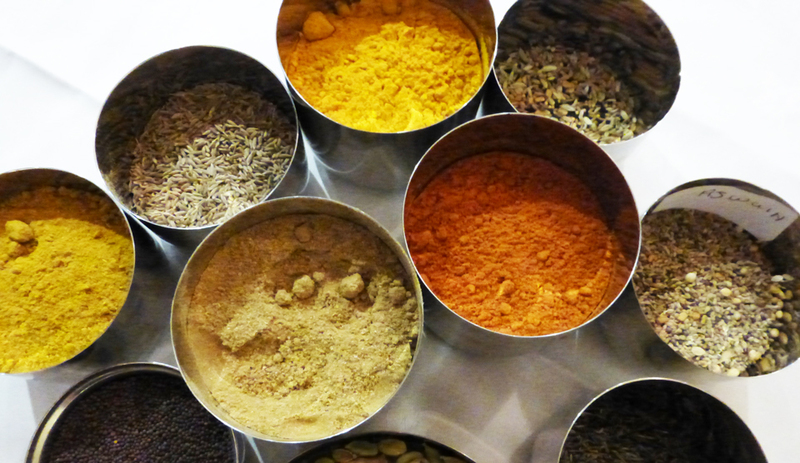 We use the Dorset Naga to create our very popular and very hot curry for the restaurant called The Dorset Blast. The chilli is used when it is ripe and red. The term ‘Tandoor’ refers to a variety of cookers that cooks at a very high temperature up to 480°C (900 °F) which is very hot. At the restaurant we have a Tandoor chef who is responsible for all aspects of cooking the tandoori dishes on our menu. We have a selection of chicken, lamb and prawn tandoori dishes. All our dishes are marinated in our homemade garam masala, yogurt, mint, methi, lemon juice, ginger, garlic, fresh green chillies and coriander before being cooked in the tandoor oven. Tandoori dishes are considered to be a healthy option as most of the fat is lost during cooking due to being cooked at a high dry heat (similar to a barbecue). A Dhansak is a hot, sweet and sour dish cooked with lentils. Bhuna is a medium spiced tomato and onion based dish with fresh coriander. In the restaurant we make our Jalfrezi dishes with lamb, chicken, prawn or vegetable which is fried with fresh green chillies, peppers, onions and yogurt. As we use fresh green chillies, which can vary in heat, the dish can range from a medium heat to a hot dish. A bhaji is a dry way of cooking. Our vegetable dishes are fried with the spices with a little if any water with the exception of an onion bhaji that is made differently. Onion Bhaji is the English name given to an onion pakora, a spicy Indian snack cooked in a batter using besan (ground chick pea) flour.